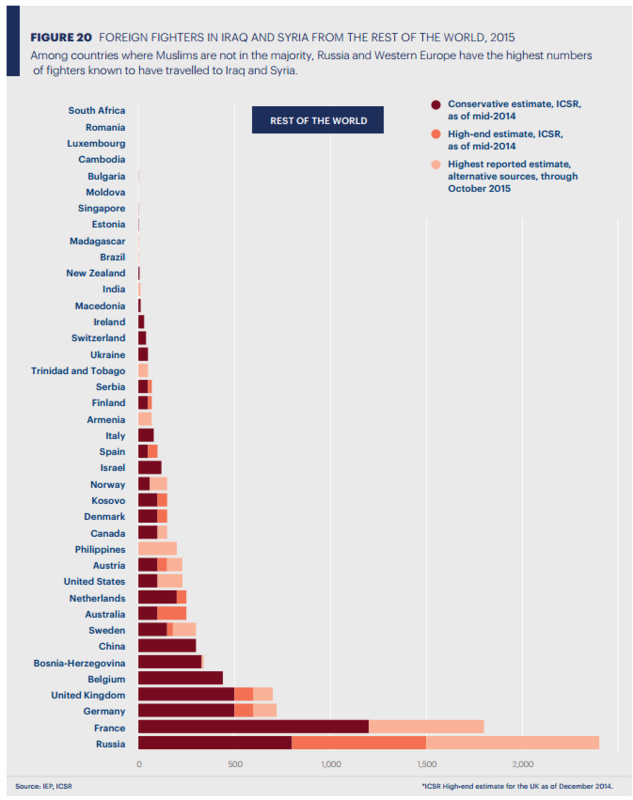 Where does Ireland stand in terms of global terrorism? A report published this week revealed a nine-fold increase in the number of deaths from terrorism in the since the beginning of the 21st century. Tributes are left at the La Carillon restaurant in Paris, following the attacks in the French capital. AMID THE AFTERMATH of the Paris terror attacks, a report was released this week highlighting the impact of terrorism all across the globe. The Global Terrorism Index revealed an increase of 80% in deaths from terrorism last year when compared to the previous year. This is the largest increase in the last 15 years. Since the beginning of the 21st century, there has been a nine-fold increase in the number of deaths from terrorism, rising from 3,329 in 2000 to 32,658. Though the report pointed out terrorism remains highly concentrated in countries like Iraq, Nigeria, Afghanistan, Pakistan and Syria, it said it is spreading to more countries. The number of countries experiencing more than 500 deaths increased from just five to 11 on one year. In the West, ‘lone wolf’ attacks account for 70% of all terrorist deaths since 2006. The majority of these incidents were attributed to a mixture of right wing extremists, nationalists, anti-government elements and other times of political extremism, rather than Islamic fundamentalism. So where does Ireland stand in all of this? In this latest index we ranked 48th in the world in terms of the impact of terrorism, well behind other European countries like the UK at 28th and France at 36th. When it comes to fighters travelling to Iraq and Syria, Ireland ranks low on the list. The majority of foreign fighters from countries where Muslims are not in the majority travelling to join terror cells from Russia and France. Previous research has already indicated 26 fighters have left Ireland to join Syrian rebels. 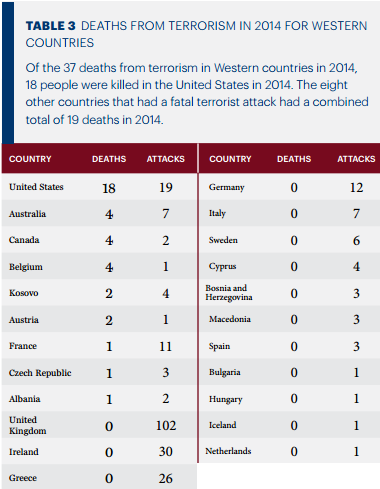 Of the 37 deaths from terrorism in western countries last year, 18 were in the US. According to the report, there were 30 attacks in Ireland, but no deaths were recorded in these attacks. The highest number of incidents was in the UK. However, none of these 102 attacks resulted in fatalities. The majority of these attacks occurred in Northern Ireland and involved the New IRA. Northern Ireland has also influenced European statistics. The region had the lowest ratio of deaths per attack because of the 79 incidents in Northern Ireland which had no casualties last year. 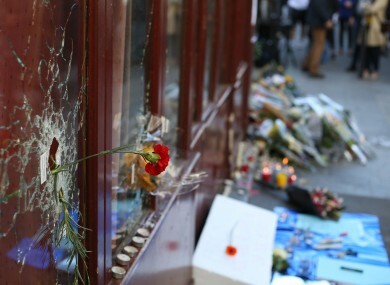 In Europe around half of the attacks used explosives and 10% of attacks used firearms. Terrorist attacks became more deadly in 2014, even though 46% of attacks didn’t kill anyone, the lowest proportion since 2007. The attacks in Paris have changed the climate somewhat and big changes and decisions are currently being made in European countries. This week Taoiseach Enda Kenny said additional Irish troops may be needed in peacekeeping missions in Lebanon and Mali as France may decide to withdraw their presence. He said an incident in Ireland is “possible, but not likely”. A Claire Byrne Live/Amárach Research poll this week found 91% of Irish people believe Ireland is not adequately prepared to defend against a terrorist attack. An Garda Síochána, which is responsible for national security, said it is in close contact with security partners in Europe. Since the events, the force has conducted an intelligence assessment review and the threat level remains unchanged. However, it said the level of threat will be kept under constant review and all appropriate measures will be taken to deal with any threats. Email “Where does Ireland stand in terms of global terrorism?”. Feedback on “Where does Ireland stand in terms of global terrorism?”.